Although the animated gif has always been popular, the recent explosion of animated gifs thanks to sites like Buzzfeed has been astronomical. 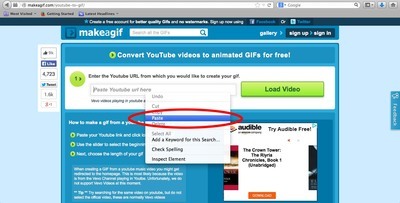 This tutorial will show you how to make an animated gif from a Youtube video using a free online service at makeagif.com. Find a Youtube video you would like to turn into an animated gif. The first thing you will need is the url, or web address, of the Youtube video. Go to the video on Youtube and click inside the address bar at the top of your web browser three times or until all the text is highlighted. Copy the address by right clicking the text and clicking on copy. 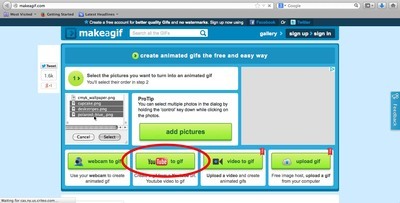 Go to makeagif.com and click on the Youtube to Gif option. 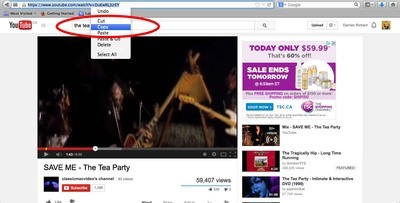 Paste in the url by right clicking in the “Paste Youtube url here” box and clicking on Paste. Once the address is there, click on the green ‘Load Video’ button. This will bring up some options below and the video will run on the left. 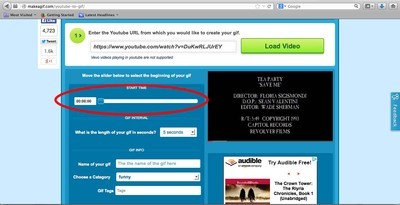 Use the slider on the right to choose where in the video your gif should start. Once the beginning has been chosen, the video on the right will commence in the same spot and run for the default time of 5 second before looping. The length of the gif can be chosen by using the dropdown box located below the slider. Unregistered users can set the time from 1 to 5 seconds where registered users can create longer intervals. Next, you must fill out the require info fields. First name your gif, then choose a category, and ad some tags. Click on Create gif to complete your animated gif. This may take a few minutes, do not leave the page or you risk losing your work. Once complete, a new page will load with your gif. Below the gif is a download button and some generated bits of code that you can use like HTML or bulletin board script.